Absorb the relaxing and comfortable country atmosphere at Oliver`s Restaurant & Lodge in White River, Mpumalanga, South Africa. Experience intimate comfort in the well-appointed accommodation offered at Oliver's Restaurant and Lodge. Scenic views of the lucsious green lawns can be enjoyed from your private veranda or balcony on a tranquil holiday at this Mpumalanga retreat on the White River Country Estate. 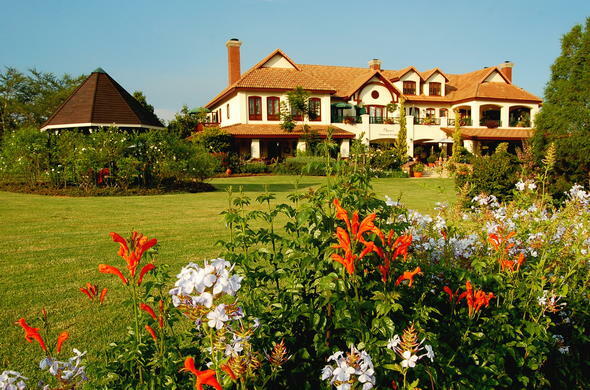 Oliver's is one of the best golf lodges in South Africa, where you can choose to tee off at White River Golf Course or any of the other nearby colf courses including Hans Merensky, Leopard Creek and Sabi River Golf Course. There are many other ways you can spend your days at this White River lodge. Oliver's Restaurant & Lodge is a wonderful place to spend those tranquil evenings after a round of golf at White River Golf Course - one of the leading golf lodges in South Africa. The lodge philosophy is to extend a warm welcome to anybody entering this little haven and to let them unwind in a peaceful and tranquil setting, spoil them with mouth-watering dishes together with professional, personalised and friendly service. “A home away from home atmosphere!”Award-winning cuisine is offered with continental and mediterranean dishes from the a-la-carte menu served with only the finest wines from the well-stocked cellar. Fun-dining with fondue and raclette may be enjoyed in the privacy and irresistible romantic ambience of the wine cellar. Oliver's also serves as a base destination for those who want to explore all that Mpumalanga has to offer without comprising quality and comfort. Experience all that the breathtakingly beautiful Panorama Route has to offer such as unique geological features, dramatic mountain ranges, deep ravines, and cascading waterfalls. Embark on day trips to Kruger National Park in hopes to witness the African Big Five - elephant, rhino, buffalo, lion and cheetah.